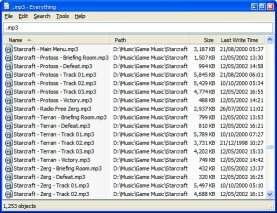 Probably this freeware that I’m about to introduce is the most efficient file search tool that I ever used. It only searches filename and does that job very well. It does not search the file contents. It lists up all the files that includes the search keyword that I type in real time. It supports various boolean operators , wild cards , and regex expressions . It is so amazing. For example, To search files with particular extensions, let’s say mp3, try this. For more keyword samples, check the homepage FAQ. 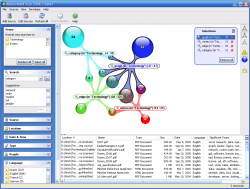 It is a desktop search tool with output of graphical relationships between your search result. It can check and analyze your Word Excel and PDF files in your local desktop. It is a nice tool. It’s now open source. Just setup and use it. I may be able to find some hidden gems in my dark hidden spot of my desktop.